I know that mid-January is a little late to be making my New Years Resolutions, but I had to think for a bit about these ones. Woodworking is still a very new craft for me, and I want to advance my skills, but not set goals that are unrealistic. Here is a first shot at my woodworking resolutions for 2011. Learn Google Sketchup, and use it to design at least one piece of furniture this year. 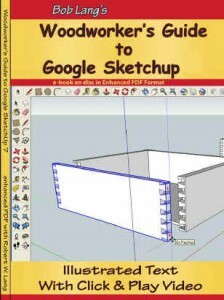 I’ll be using Bob Lang’s Woodworker’s Guide to Google Sketchup to learn the ins and outs of this highly capable free design program from Google. Organize my workshop. This is a big one, of course, and a subjective call on when I have actually ‘completed’ the goal. But there are some specific items that I want to finish, including improving the lighting, moving the wood rack to a better location and building another bench/table for my Triton miter saw to sit on. Learn a few specific techniques that I think are pretty cool, including hand-cutting a dovetail joint and hand-cutting a mortise and tenon joint. Maybe I’ll read through the Woodworking Tips Library on the Highland Woodworking website for ideas and help on other techniques that I am trying to grasp. And if I can’t find it there, I bet the Info Search will help me find what I need. 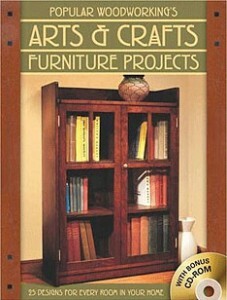 Start building the arts and crafts bookcase from this book that I’ve had my eye on for awhile. I already priced some lumber, and now I just need to re-read the instructions 50 times and spend some time with a friend who has a tablesaw setup with a dado stack and a miter gauge. Or figure out a way to cut 24 tenons without a tablesaw. Any ideas? I guess I could get really good at hand-cutting them, i.e. Resolution #3! What are YOUR Woodworking Resolutions for 2011? another good power tool way for cutting tennons is with a router and a good straight bit.